The Cherith Brook was a lovely place. The trees provided shade from the hot sun during the day and a cozy spot to rest at night. 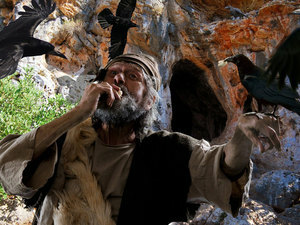 With the ravens coming twice a day bringing bread and meat, Elijah had all the provisions he needed. God was caring for him and he was quite satisfied. Part of the reason he was so comfortable with his outdoor home was because there had been no rain. Days turned into weeks...then months...then years. Elijah noticed small changes taking place. The grass began turning brown. The trees didn't have as many leaves. The animals were smaller than normal. The water level in the brook was getting lower and lower. In some places, he could see the muddy bottom, and, in other spots, he was able to walk across on dry ground. Then one day, it happened . . . .
Elijah awoke hungry and thirsty. He went to the brook for a drink of water, but there was none. The brook was completely dry. He waited for the raven to bring his daily food. Morning slipped away into the afternoon, but the raven didn't come. Elijah waited and waited. Surely the bird would bring his evening meal. Evening came, and then nighttime, but the raven still didn't come. WHAT was he to do? Had God FORGOTTEN about him? Why, of course not! God was keeping the promise that He had told Elijah to tell King Ahab. Which was: There would not be any rain for a long time. Just when Elijah was beginning to wonder what he should do, he heard a voice. "Get up! Go to Zarephath. A widow woman will take care of you there." He realized it was the voice of God, so he listened very, very carefully. "Zarephath? My, what a strange name! 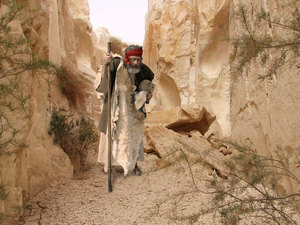 But if that is where God wants me to go, then that is where I must go," Elijah thought to himself. Off he went, walking down the dirty road. This journey was so much different than his trip to the brook. It was so hot! There was no water anywhere! He had nothing to drink and he was getting so thirsty. Everywhere he looked there was nothing but dry, dusty ground. He did see a few plants trying to grow, but, without water, they were awfully thin and scraggly looking. He was hot . . .
and thirsty . . .
...but there was nothing he could do except to continue on. You can imagine how excited Elijah was when he finally saw the town of Zarephath just ahead! Anxiously he trudged along. How he was looking forward to having a cool drink of water from the well! 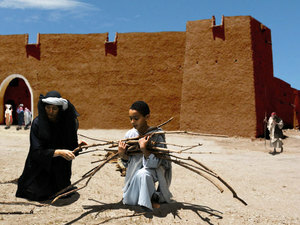 As he got near the city gate, he looked around and saw a woman gathering sticks. "Please bring me a little water in a jar so that I can have a drink," he said to the woman. 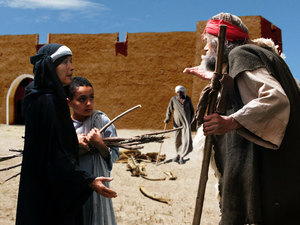 Right away she put down her sticks and started toward the well to bring Elijah the water. She hadn't taken very many steps when she heard him call out to her again. "Also, please bring me some bread." The lady was somewhat startled and turned to face Elijah. "I don't have any bread," she said with a frown. "All I have is a handful of flour in the bottom of the barrel and a tiny bit of oil. I came out here to gather two sticks to build a fire in order to bake a small pancake for my son and me. After that, I guess we will just starve to death because there is no more food." Oh my! What is going to happen now? This was the same widow woman whom God promised would feed Elijah. She didn't even have enough food to make one good meal for herself and her son. How would she be able to take care of Elijah? "Don't be afraid," Elijah said to the worried woman. "Go! Do as you have said! Build the fire and make the pancake, but bring it to me first. Let ME eat first. Then make something for yourself and your son. The Lord God says that the barrel of flour will never be empty, and the bottle of oil will always be full until the day that the Lord sends rain." Hesitantly, the woman took the flour out of the barrel. Then she poured the last bit of oil out of the bottle. She mixed them together and put the mixture in a small pan on the fire she had built. When it was finished cooking, she put it on a plate. Then she stopped to think a moment. If I give this last little pancake to Elijah, what will my son and I eat? Will the words Elijah spoke be true? Will God keep the barrel full of flour and the bottle full of oil like Elijah had said? Then she remembered something. She had heard of this man named Elijah. He was the one who had gone before King Ahab and told them there would be no rain until he said so. At first, people made fun of him and didn't believe him. Hmm . . . they ALL believe him now! It hadn't rained for such a very long time, and many people, including the king, blamed Elijah. The widow knew that she had to give him the pancake. After Elijah ate the little pancake, the woman went to the barrel. She was almost afraid to look. Slowly, she removed the lid . . . .
She peaked inside . . . . There was PLENTY of flour. She scooped up enough to make herself and her son a pancake. She picked up the bottle of oil and found it full. She poured out enough to mix with the flour. She poured the batter into her pan and placed it on the fire to cook. They all had a delicious pancake for dinner that day. and the next day. . . . In fact, the barrel of flour didn't run out, and the bottle of oil stayed full until the Lord sent rain just as Elijah had said. What a wonderful God we have! When the ravens stopped giving food to Elijah, did it mean that God didn't care about him? What do you think would have happened if the widow had selfishly kept the last pancake for herself and her son? God has promised to supply all you need. "But my God shall supply all your need according to his riches in glory by Christ Jesus" (Philippians 4:19). You and learn to listen to Your voice. use both activities for older children. Last updated May 6, 2016.